By Ryan AveryJuly 25, 2016Motivational Stories, Strategies and Insights! Here we go! 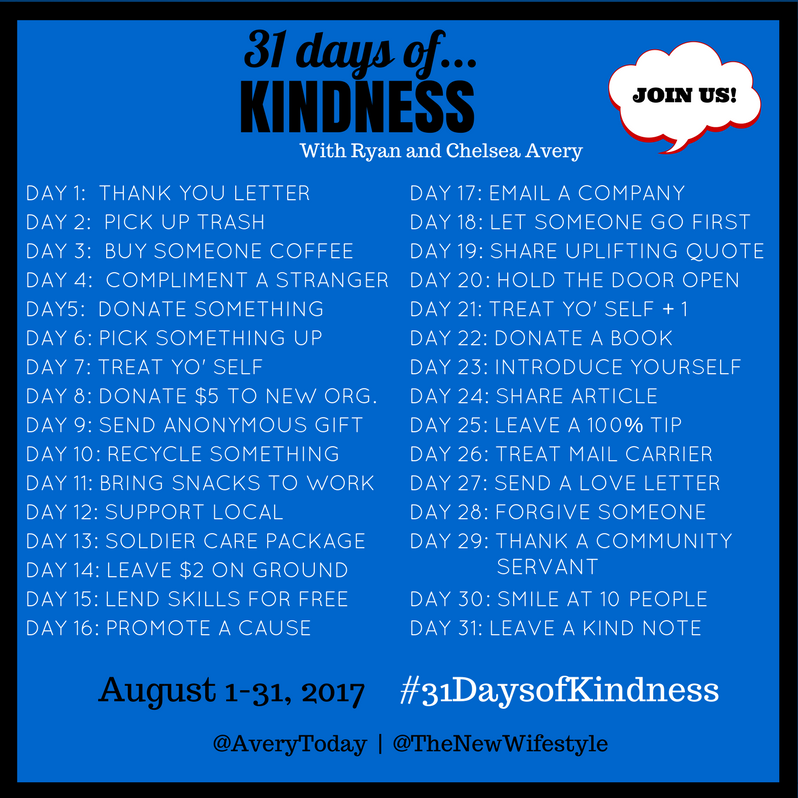 31 days of kindness is starting August 1, 2017. This year we want 1,000+ people on board who, collectively, will do more than 31,000 acts of kindness in 31 days! AWESOME! Sign up here to get the daily email reminder. First time you are hearing about this? Still join in and take the challenge, we hope you will! 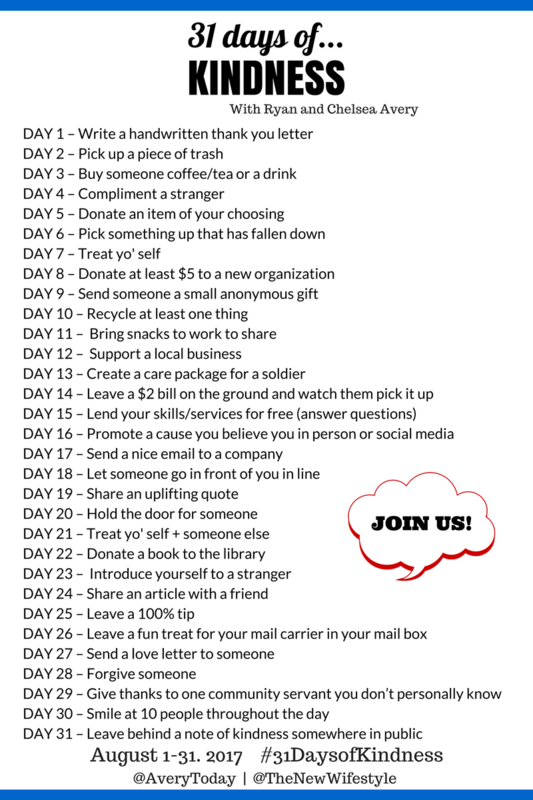 How it works: Each day we do one act of kindness listed below and use #31DaysofKindness to share, comment and connect with others who are taking part in the challenge. Make sure to post photos and share updates because at the end I will collect photos and make us a HUGE collage to share with everyone who participated! You can also share this with your friends, family and neighbors to get them on board! The more we have join, the more good we do as a group! So share away! We have also created sharable images for you to use in your home, office and with your family and friends: Printable Poster, Facebook Banner, Instagram Post and Twitter Image. The hardest part about this act of kindness might be to remember where your stamps are or to drive to the post office to get them. Take time to get a letter written and sent out to someone in your circle of friends, family or community who you can encourage, inspire or thank! There is always trash on the ground and we can do something about it! Think what would happen if everyone picked up one piece of trash everyday? Let’s keep our eyes peeled for what piece of trash we can pick up to clean up our streets, sidewalks or neighborhood! Most of us take time out of our day to go and grab a drink of coffee, tea or late night drink. Take the time to buy the person’s coffee behind you. If you don’t drink coffee or tea, pull through a drive though coffee shop pay $3 for the person behind you and drive away! See how good you feel! Walk by and complement a stranger on what they are wearing, their hair or smile. Bonus points if you give them a high-five when you walk by! Most of us can agree we have more than we need. What is in your closet that you can donate to a local shelter or Goodwill and have someone else get benefit from your amazing fashion sense? What about kitchen goods or toys? If you are walking down the street and see one of those fallen sandwich boards or you are in the grocery store and see something that fell off the shelf, find a way to put it back up! This might encourage others to do the same when they see you going out of your way to do something kind for others! DAY 7 – Treat Yo’ Self! We had this idea brought to our attention from a participant of #31DaysofKindess! He reminded us that many of us often need to be kinder to ourselves – so true! Treat yo’ self to a pedicure, a new book, leaving work 30 minutes earlier or fine leather goods. If you need more ideas, see where this idea stems from. Research a cause you believe in and donate at least $5 to their mission. It might not sound like a lot but those little donations add up for organizations and can be a big benefit if a lot of people do this. When 100+ of us do this, we will have given more than $500 collectively today to good causes around the world! It blows my mind how many people still do not recycle! This is one of the easiest ways to give back and be kind to our environment. Take time to recycle and if you don’t have recycling at your office or home, what can you do today to help make that a reality in your area? Instead of grabbing a bite at Subway or getting a few items at your local Target, stop by a local shop and support your community entrepreneurs by eating at a local restaurant or buying what you need at a local shop. I invite you to take time and invite others to join in especially your family or friends to help you with this one. You don’t need to spend a lot of money (you don’t even need to spend money at all). You can write letters, send candy or books and so much more. Here is a good site to use called Any Soldier. If you are outside of the USA, see what your government allows and how you can support your troops. Give thanks to those who provide us with our everyday freedoms. This is one of the best and most interesting acts of kindness we will do. First off, go to your local bank and ask for a $2 (they will love you for taking those off their hands). Then go and place it somewhere a random person will see it and pick it up. You might be surprised by how many people walk by it before one person notices it! There are several ways you can do this. Use the #question on Twitter or Facebook. Post on your social media that you can help <BLANK> with <BLANK> and the first person to reach out gets <BLANK> minutes of support. Go and volunteer for an hour or put your skills to the test. This one will make you think and question, what value can I add to others and who can use my skills/services? There are so many great causes and organizations working hard to create positive change in our world. Talk about one of these causes that is important to you either in person with people and/or social media. We might take the time to send a complaint to a company who did us wrong but how often do we send an email or letter to a company who we appreciate is doing the right thing or treating their customers with respect? Send a nice email thanking that company for what they do, the products they offer and services they provide! Whether this is at the grocery store, at the coffee shop or waiting to pick up your burrito, this is a kind gesture to extend to someone! You never know what kind of day someone is having and often when we see positive or uplifting quotes, it can help reset our minds. Share an uplifting quote with a friend or via social media. This one is another tricky one because we have to be on the look out all day for this opportunity. Take the time to look around for when someone might need the door opened for them. Smile, maybe give them a high-five and do it as many times as you can! Reference day 7 for what this means except this time, include someone else! Treat your mom to a pedicure, your dad to lunch or your friend to that delicious cupcake in addition to yourself! Throw kindness around like confetti! Your local library could really enjoy some of your old childhood books or best-sellers that you never read anymore. Children, adults and teens can really benefit from those books we don’t use so select some off the shelf, drive by your local library and donate them! Say “hi” to someone you walk by. Sit next to someone else at lunch. I bet there might be people at your office you don’t know fully, say hi and introduce yourself. A hi can go a long way! Have you read a great article recently that you know could benefit a close friend, peer or family member? Take time to show you care by sending them an article with an email to say “Hey, saw this and was thinking about you. Thought you would enjoy it.” Please don’t send one of those obnoxious FWDs. Send an article that adds real value to their life. This one will make your day! It does not have to be on a $50 meal. It can be on a $2 coffee you buy or $8 lunch you purchase. Leave that 100% tip and talk about doing a HUGE act of kindness. Those waiters will be talking about that for a while and you spread more kindness that way because they in turn go and talk about what just happened to their friends and family! I would recommend nothing that can melt in the southern states this summer but pick something that is fun, sweet and says thank you! You can even write a note letting them know how much you appreciate always delivering your mail. There is something magical about receiving a letter in the mail and something extra magical when it’s a love letter! While we recommend sending one to your significant other if you have one, there are plenty of other family and friends you love in your life! This one is tough but we never said this challenge would be easy. Let’s be kind today by forgiving someone that hurt us, let us down or disappointed us. This will make room in your heart and mind for more kindness when you release resentment. You could let this person know they are forgiven by a letter, phone call or meeting. Another option would be to write a letter forgiving them and put it away without mailing it because the action is more important for you. Is there a firefighter, police office, civic servant or someone in your community who is adding value to your community that you need to thank? Go to their office, write them a letter or give them a call to say thank you for all they do to make our community safe! You know that feeling when you randomly lock eyes with a stranger and he or she flashes you a pleasant smile, which you hopefully return? Now it’s your turn to be the one intentional about putting on a literal happy face and smiling to at least 10 people throughout the day! When we do all of this, imagine what we will have accomplished together as a team! Let’s spread the word! Think you know others who would like to join us? Ryan – love this. And you know what’s even better than 3,100 acts of kindness? 31,000 acts of kindness (1,000 people X 31 days = 31,000). You and Chelsea are so awesome, stop selling your self short! Ah, great catch! Even better than 3,100 acts of kindness is 31,000 acts of kindness 🙂 Thanks Mike and glad you are joining us this year! What an amazing project (and so well organized!). I’ve recently started my own year-long kindness project – hope you don’t mind me leveraging some of these ideas. Signing up for the email reminder! Great initiative. I am game . Thank you Ryan.